Three French soldiers of The Great War brood in a cell. Their execution is scheduled for dawn. Cold walls surround them, offering no solace. One of them lays curled up silently on the floor, going mad from his fear of death. Another, Corporal Paris, waxes philosophical: “See that cockroach,” he says. “Tomorrow morning we’ll be dead and it’ll be alive. It’ll have more contact with my wife and child than I will. I’ll be nothing, and it’ll be alive.” The third soldier, Private Ferol, slaps his hand down and crushes the insect, “Now you got the edge on him.” This biting commentary might be interpreted as an anti-war statement, as it was during trench warfare where the three soldiers committed the “crime” that earned them an overnight stay on death row. 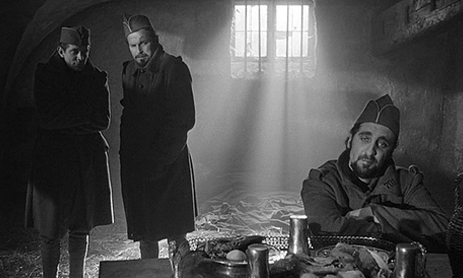 Since the harsh sentence derives from the soldiers’ alleged cowardice on the battlefield, versus an outward criminal deed, Stanley Kubrick’s Paths of Glory, the director’s most humanist film, should not be considered solely an anti-war film, but also a depiction of the horrors of war, specifically those authorized by the governing political structure. Defined through the power-mongering among aristocrats and inequality on the social ladder, Kubrick’s critique aims toward the ignorant, inhuman System and ruthless logic of military law. Kubrick’s setting is the French-German conflict near the end of World War I—a war not bound by the outright ethical struggles of good and evil in comparison to WWII, but set afire largely by an unfavorable mix of distrust, unruly demands, strained alliances, and jumping the gun, so to speak. Though often described as the first “Great” war, what remains is soldiers blindly dying in some of history’s bloodiest of battles over disputes best remembered for setting up the successive (and decisive) war. Untenable from a humanist perspective, WWI affords Kubrick a backdrop ripe with authoritarian hypocrisy and class struggles: the stuff of grand drama. Based on the novel by Humphrey Cobb, which Kubrick read in his youth and remembered fondly for its true accounts, the film involves the engineered execution of three soldiers as political whipping boys for an Official hell-bent on making an example, not to mention a name for himself. Decimation, as it is known, goes back to pre-Roman times, but the French used it during WWI to promote good behavior, order, and a sort of forced bravery among the ranks. Kubrick uses Decimation as the dehumanizing apparatus employed by bureaucrats—an order that singularly does away with a soldier’s individuality by reducing him to a number and removing his humanity, and then places him before a firing squad. The film’s French Officers assemble not in a rugged barracks but rather a refined chateau seized to house generals with too much power. Indeed, Kubrick’s choice of location for military command suggests the film’s underlying social conflict. Gaudy, and somehow seedy despite its shine, the posh chateau sports massive paintings and ornamental decoration—an absurd locale for men planning war. 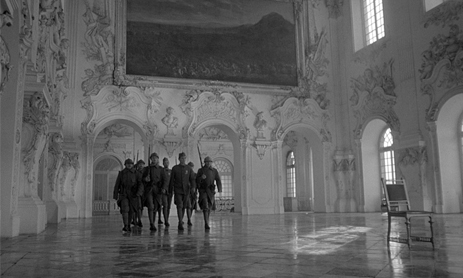 As the film progresses, cinematic battles between the French and German combatants, however expertly photographed by Kubrick and cinematographer Georg Krause, become secondary to the warring classes within the French chain of command—in particular, the humanism of grunt soldiers, whose barracks are no more luxurious than a hole in the ground, versus the cold, promotion-obsessed command staff, led by men of uncompromising bureaucracy. Such men are General Broulard (Adolphe Menjou) and his subordinate General Mireau (George Macready). The film’s first scenes tender a defining exchange between the two: Broulard commands Mireau to send his division onto The Ant Hill, an uninspiring name for a well-defended military target—a suicide mission. Mireau objects, citing the likelihood of vast casualties and small probability for victory. Broulard mentions the possibility of Mireau’s advancement with another general’s star; suddenly Mireau insists the odds of success are not so small. On the turnaround, when Mireau instructs Colonel Dax (played by the square-jawed Kirk Douglas in his fiercest role) to plan the assault, Dax makes the same objections, which are obstinately disregarded by Mireau. And yet, in the film’s first scenes Mireau sternly announces “The life of one of those soldiers means more to me than all the stars and decorations and honors in France.” But the arithmetic of human lives does not compare to the power-brokering of Generals; after all, with the soldiers’ refusal to charge, they placed Mireau’s promotion at risk. In a subsequent meeting between Broulard, Mireau, and Dax, the three discuss the pending court-marshall and the number of men to be charged. Insisting the mission was impossible, Dax supports his men. “If it was impossible,” Mireau maintains, “the only proof of that would be their dead bodies lying on the bottom of the trenches.” Mireau demands the lives of ten men from each company, a hundred in all. Dax wonders why so many, and offers himself, being the leader of the proposed cowards. This is not a question of officers, rather grunts, Broulard insists, and suggests a dozen men. Mireau’s counter-bid is whittled down to three, drawn at random. The entire conversation feels hollowly negotiated by car salesmen, save for the selfless attempt at self-sacrifice by Dax. Defending his men, Dax finds the military court cold, calculating, and opposed to all evidence but that which proves the three soldiers guilty. Inevitably, the trio of scapegoats will be executed. For a moment, Kubrick seems to suggest the execution will be halted when Dax learns of Mireau’s order to open fire on the immobile French line. This could be the dramatic 11th Hour device that brings a happy ending. While the three sentenced grunts fall apart in their cell, ignoring their last meal of duck sent by Mireau, Dax brings Mireau’s brash order to Broulard, who in turn appears to do nothing. There is no last-minute rescue, no daring race to stop the firing squad’s volley. Kubrick refuses to pull his greatest punch and give audiences their Hollywood ending. The execution goes off without a hitch. Afterward, General Mireau notes his pleasure with the procession: “The men died wonderfully. There’s always that chance that one of them will do something that will leave everyone with a bad taste, this time you couldn’t ask for better,” he says, biting into a jelly covered croissant. Uncompromising in his dedication to thematic potency, Kubrick will not delude the audience into thinking such horrors do not exist, or that soldiers can somehow overcome that they are mere tools for the Powers That Be. Mireau gets his comeuppance, however, when Broulard confronts him with a court-marshall for ordering artillery on his own men. But this is not a victory, more like a band-aid to treat a heart attack. Even worse, Broulard, completely devoid of any human feeling, believes Dax pursued his defense so diligently to secure himself a promotion—Broulard even smiles in disappointment when Dax proves himself a pitiable idealist honestly shielding humanist principles. In an earlier scene, Dax quotes Samuel Johnson on patriotism, saying “it’s the last refuge of a scoundrel.” By the end of the final exchange between Broulard and Dax, we see, at least in this context, how correct Johnson was. 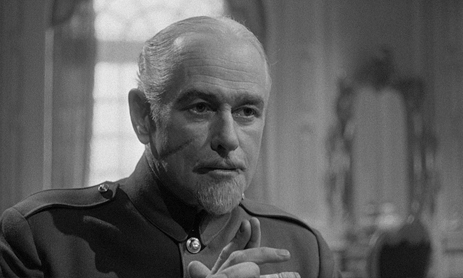 Banned in France until after De Gaulle’s death in 1970, Paths of Glory offended the strong sense of French pride for military nationalism, as well as a number of other allied countries sensitive to France’s objections, including Sweden and several American military bases. They all blacklisted the film. Before initially signing to star, Kirk Douglas told Kubrick, “Stanley, I don’t think this picture will ever make a nickel, but we have to make it.” He was right on both accounts. The film’s diminished worldwide circulation hindered box office receipts; nevertheless, it would be revisited over time and become recognized as a cinematic staple of anti-war filmmaking, and the singular example of Kubrick’s directorial craftsmanship. Kubrick’s subject designates his style. As a result, his formal presence behind the camera varies throughout his career, certainly between his filmography’s shifting genres, but his signature tonal mannerisms, his staid directness, remain consistent. 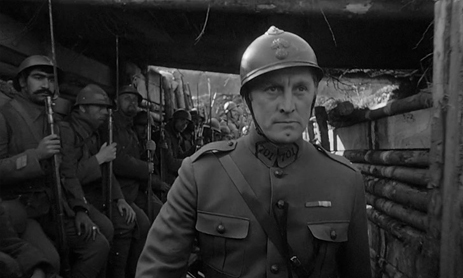 For Paths of Glory his approach includes sharp takes to reflect the uniform situation; his resourceful treatment of time brings the film’s length to an efficient 87-minutes, whereas Kubrick’s later works are known for their longer running times. 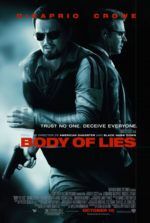 Each step is precise, filmed in deep focus, with every character giving clear performances. His presentation is unpretentious, even architectural, allowing for form to follow function in support of telling the best story possible. A lifelong chess player, Kubrick decides where each piece will go during pre-production, which often involved years of meticulous research and pre-planning of shots, later imbuing his film with an impenetrable structure of narrative and form. A perfectionist, he insisted upon take after take, sometimes resulting in his productions (notoriously) lasting two or more years. His perfection often resulted from a chess player’s intuition for “choice, consequences, and the pattern of play”. After conceptualizing, all formal elements (camera, lighting, script, etc.) 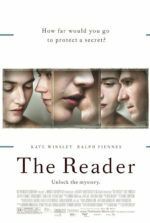 are assembled around that concept for a marriage of homogeneous style and content; whereas so many other filmmakers can often only excel in one territory or the other. Observe the practical use of the camera in the scenes surrounding the charge on The Ant Hill. Kubrick widens the size of the actual trench from an accurate four-foot space to six feet, to allow his flowing camera’s tracking shot as it trails Douglas down a gauntlet of terrified men, and soon out onto the battlefield. There, upon frayed terrain, the camera pans left along with frantic soldiers who climb and duck and fall with enemy fire. Krause focuses-in on Douglas, whistle in mouth, waving his men to continue as they fall by his side, until, all at once, Douglas finds himself nearly alone and facing an impossibly long haul before reaching his destination. 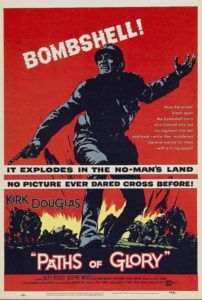 Amid chaotic warfare, the production detonated literally tons of explosives to recreate No Man’s Land. Kubrick’s enduring shots are miraculously regulated, forcing us to see the hell of trench warfare, bodies dropping everywhere, and later provide evidence for Col. Dax’s case and sympathy for the sentenced men. Kubrick’s personal touch, or style, resides in his control. However unfeasible other filmmakers find absolute control when making studio films, Kubrick maintained his independence even while working inside the Hollywood monster (though usually employed by Warner Bros., United Artists distributed Kubrick’s Paths of Glory). For viewers, his pictures feel like independent productions, and yet they sport commercial budgets from major studios, resulting in Kubrick’s oeuvre often being the entry point for moviegoers to further explore artistic, foreign, and independent realms of cinema. He was a traditionalist who focused on story, versus true independents’ search for avant-garde methods of experimentation without narrative. 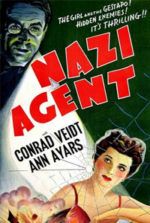 The majority of his career was spent living on the English countryside, his productions often situated in Europe, secluded from the tampering hands of Hollywood movie executives. Though his films were not independent, Kubrick remained so, operating in a private environment where he could concentrate on perfecting his conceptual processes. His seclusion instills the resulting output with a unique other-worldliness far removed from his contemporaries or anyone since. Kubrick begins Paths of Glory with the French anthem “La Marseillaise” playing over the opening credits, representing officialdom in all its horrible splendor. He ends his film with “The Faithful Hussar”, a German folk song, the words to which remain unimportant. The contrast is as distinct as the battle of songs in Casablanca, with the German tune presenting a stirring piece of historical irony in its humanistic effect. 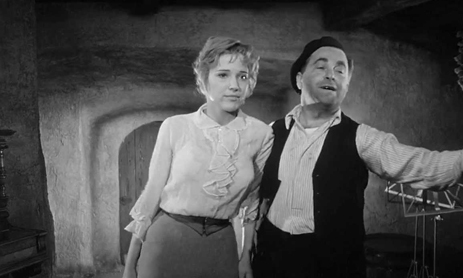 The last scene depicts rowdy French soldiers clamoring inside a tavern, hooting at a scared and crying German girl, played by Stanley Kubrick’s future wife Christiane Harlan. She quietly sings, and though the raucous crowd does not know the words, her song quells the film’s cynicism with a moment of sobering reprieve. Whereas Broulard asserts “There are few things more fundamentally encouraging and stimulating than seeing someone else die,” the girl’s song evokes something larger. The soldiers cannot follow the lyrics, but then, the words are not significant. The Frenchmen know the melody, and they hum along with it, tears now streaming down their own faces. Dax watches from outside, his faith in humanity restored by the thought that after war something of human emotion is left over. For the remainder of his career behind the camera, one gilded by masterpiece after masterpiece, Stanley Kubrick would never again put forward such an emotionally humbling scene.